It took seven families two years, but a group of homeowners in Scotland has taken on a housing giant in order to have their "crumbling" new-build homes repaired. It's part of a broader, UK-wide issue - this is their story.Sheila Chalmers moved to Peebles with her husband 10 years ago.Her three-bed home was one of 250 built by developer Taylor Wimpey on a new site in the Scottish borders.For eight years, life went on as normal. Then something strange started to happen. Overnight, families at the top end of the estate started to vanish. But there were no for sale signs and no-one new was moving in. "It became almost a ghost street," she says. "Houses were empty. People were disappearing. "Sheila later heard that the properties had been bought back by Taylor Wimpey after problems were discovered.The owners had signed non-disclosure agreements so they could not speak out. Taylor Wimpey confirmed it did buy back a "small number of homes" to start with. It later sent a letter to all the remaining residents, saying that some houses did have a problem with the mortar holding together their bricks.Sheila thought she did not have anything to worry about, but she went outside and checked anyway. Patches of mortar were clearly eroding, she says, and in other places it could be scraped out with a fingernail.She paid for assessments by two different structural engineers, who both said the house needed extensive repair work, though Taylor Wimpey said its own inspections found that was not the case.Mortar is made up of two key materials: cement and sand. The more cement in the mix, the stronger the mortar, though the more brittle it can be.The family paid to have their laboratory tests on the mortar carried out by a specialist firm.The results suggested that there was far more sand in the mix than you would expect for a home in that area, although Taylor Wimpey says the type of chemical test used was "not appropriate" and the results could not be relied upon.Our investigation in 2018 found similar complaints about weak mortar across at least 13 estates in the UK all built by different companies. Three doors down from Sheila, live Pete and Jill Hall with their 13-year-old son. Like Sheila, they first learned about the problem two years ago when Taylor Wimpey were buying back the individual houses.They paid for their own tests, which showed only one in eight samples taken from their home met industry guidelines, although again Taylor Wimpey says the test used was "not appropriate". "On the garage the tests came back showing it was just sand," said Pete.A video filmed by the family after a rainstorm clearly shows the mortar on the back wall falling out when a screwdriver was run gently along it. In the end, seven core households became involved - passing on details to a wider community group on the estate.The families worked together to build their case, paying for their own structural surveys and using Freedom of Information laws to demand internal documents from the local council. 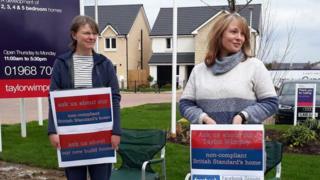 They made handmade signs and protested outside the showroom of another Taylor Wimpey estate in the area.In 2017, they presented their findings to Taylor Wimpey's lawyers, saying that they would go public if their properties were not fixed, demolished or bought back. They were surprised at the response. The families' solicitors received a letter back saying they had decided not to report the group to the authorities under the Proceeds of Crime legislation. "It was accusing us of bribery, effectively," said Pete. "It took me about 10 minutes to stop laughing. But it was intimidation, a threat." By then, Pete and Jill had hired their own engineers to examine the house. They recommended that the couple should stop using the garage because it was at risk of collapse, although Taylor Wimpey denies that there was a structural problem.The couple bought a giant shipping container, covered it with warning stickers and left it on their front lawn.That, they say, got Taylor Wimpey's attention and - two years down the line - an agreement has now been reached for their home to be fixed. "It falls short of where we think a full repair should be, but they have said it's that or nothing - so we have accepted it," Jill says. In December 2018, Taylor Wimpey sent out letters saying all 130 houses in the estate built with the weaker mortar would now be offered "remediation" work. Properties are being dealt with one at a time. Construction crews are scraping out the old mortar and replacing it with a stronger material. Taylor Wimpey said it "sincerely apologises" to the all the homeowners affected, is "fully committed to resolving matters" and has "a clear plan in place to remediate affected homes". "This is a localised issue and falls short of the high-quality standards we uphold," it said.The firm has now apologised to Sheila and, even though its own inspections found a full repair is not needed, said work to replace the mortar in her home will start this summer. It will refund the "Somebody has to stand up and show them that they cannot get away with it."